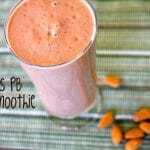 Want to learn how I made the world’s best dessert smoothie? It all starts with homemade almond milk. Honestly, what took me so long to try making this at home? I can never buy boxed almond milk because I’ve never found an unsweetened version with no added sodium. 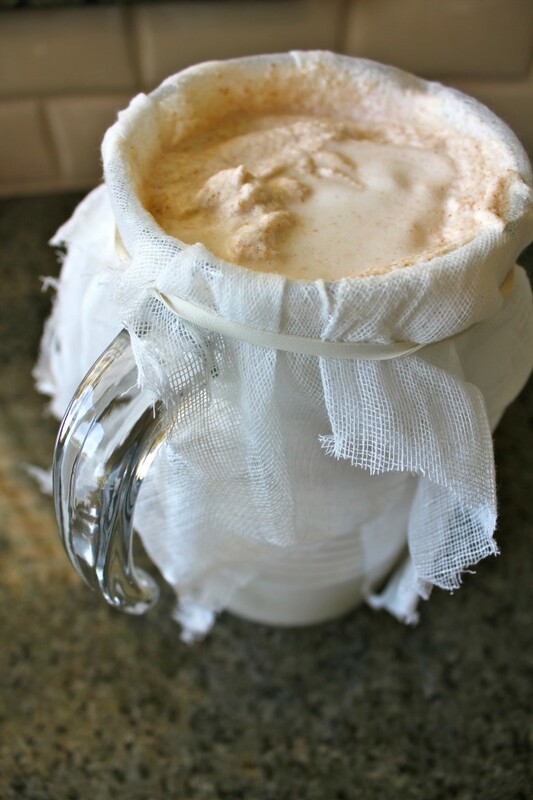 I even had a pound of almonds in my freezer AND some unused cheesecloth [editor’s note: I have recently been buying paint strainer bags at the hardware store and they work great as a nut milk bag; read about it here]. This is where Gena’s advice came in really helpful. 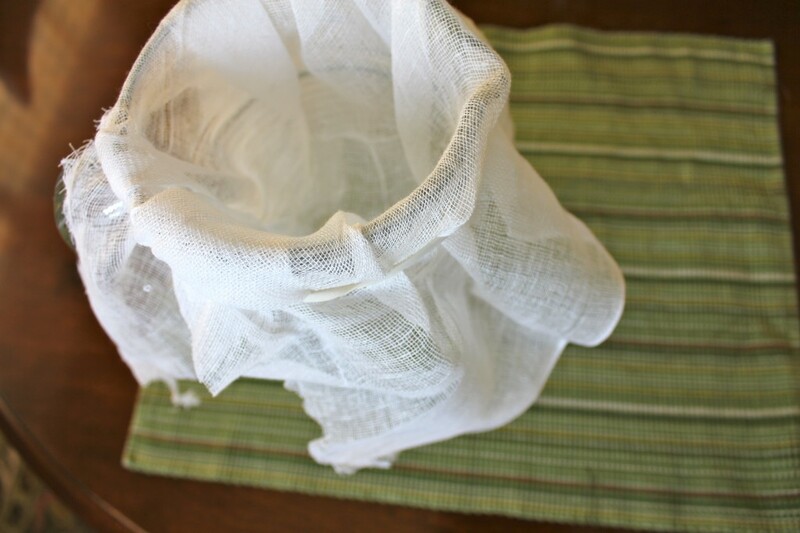 I used a thick rubber band to secure the cheesecloth around the edge of the pitcher, otherwise it would have fallen into the pitcher when I strained the almond milk. [Editor’s note: I’m using a different technique for making almond milk which you can read about in this updated post]. I wasn’t patient enough to wait until it was finished straining to use some of the almond milk, so I poured off 2 cups to make what turned out to be the world’s best dessert smoothie! I’m crediting the homemade almond milk for the feat because it was so luscious and sweet. I simply combined 2 cups of the almond milk, a frozen banana, 1 cup frozen strawberry and mango chunks, 3 dates, 1 tablespoon of peanut butter, 1 tablespoon of flax meal, 1 tablespoon of cacao powder and a splash of vanilla. Honestly, best. smoothie. ever. 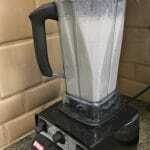 In a high-speed blender, combine all ingredients and whirl until smooth. 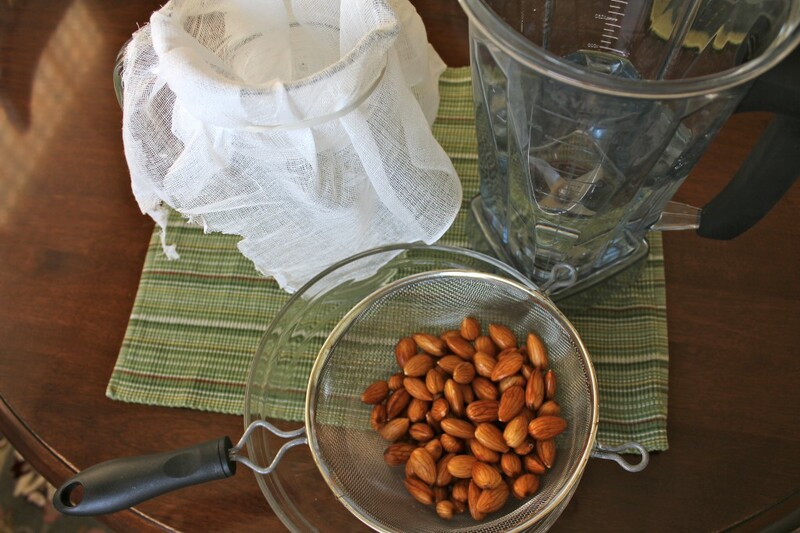 Soak almonds overnight or at least 8 hours in water. Drain and rinse. 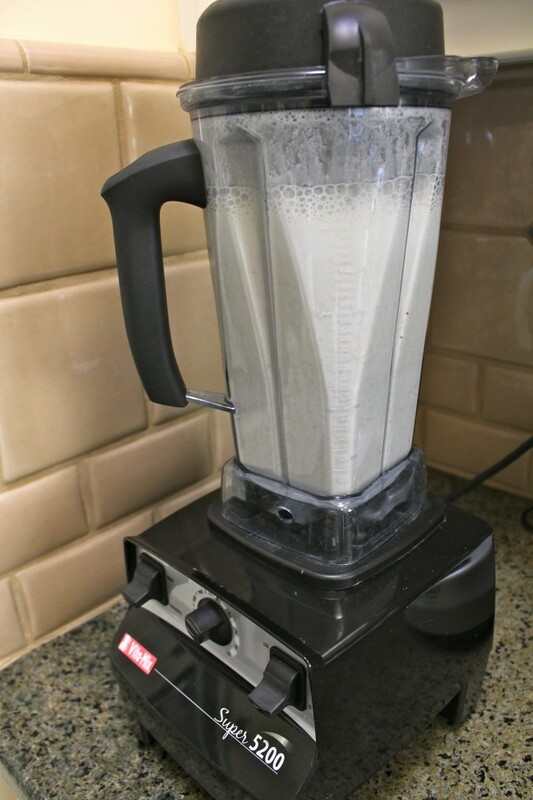 Combine almonds and 4 cups filtered water in a high-speed blender and whirl until smooth. Strain resulting mixture through a nut milk bag and let sit until completely strained. Refrigerate almond milk for up to 5 days. As far as the almond pulp goes, I have a recipe for making it into cookies. There are also savory recipes you can make, like adding to a veggie burger. I’m not sure what I’m going to do, but I’ll be sure to post my results. Want more of Carrie on Living? Connect with me on Facebook, Twitter, Pinterest, Instagram, or Google+. This sounds so divine – amazing – must try. Thanks Susan! Nice to connect with you again, how are things? Thanks for the recipe for almond milk Carrie. Do you refrigerate the mixture while it’s straining? You’re welcome, Will! And, yes, I did refrigerate the mixture during the straining process (I ended up leaving it in the fridge overnight). I’ve also seen the almond pulp used to make nutmilk cheese. Do you have a link for that? I’d love to do that! Hi Bitt, do I have a link for what? I’m not sure what you are referring to. Thanks! I wanted a link for a recipe for the almond pulp nutmilk cheese that Devon mentioned. Sorry not sure if Devon can get the reply. Oops sorry. If I come across a recipe, I’ll post it. I have a feeling that any type of nut cheese will have too much salt in it for me. I could always leave it out but then it would probably be too bland. Hi Devon, brilliant idea. As long as I can find a recipe without too much added salt, I will try it, thanks!!! ok I have that ebook. so there is no nut pulp ferment. oh well! Are you following this whole smoothie controversy? Hi Wendy, I am following the controversy. I wanted to post on the Herbivore site yesterday but she disabled comments. From what I can gather, there is no scientific evidence to back up the claims being made, other than high-fruit smoothies raise blood sugar levels. I will try to post on this soon, are you going to post on it? You picked a fun day for a smoothie recipe. I’d still drink it. 🙂 I never have tried the CR straining method, but I am sure it’s great if you have no nutmilk bag, let gravity work for you. I am trying to get a post on this together. Carrie- do you dehydrate your almond pulp or stick it in the freezer as is? Hi Kristie! I have been told by date growers that Medjool are the sweetest, so I often use those most often. For quicker straining squeeze the milk out of the strainer like milking a cow. It’s tedious but its faster. The more times you strain it the silkier it will come out. Hi Carrie, I have seen some almond milk recipes (like yours) which drain and rinse the soaked almonds, and then add fresh water for the blending. 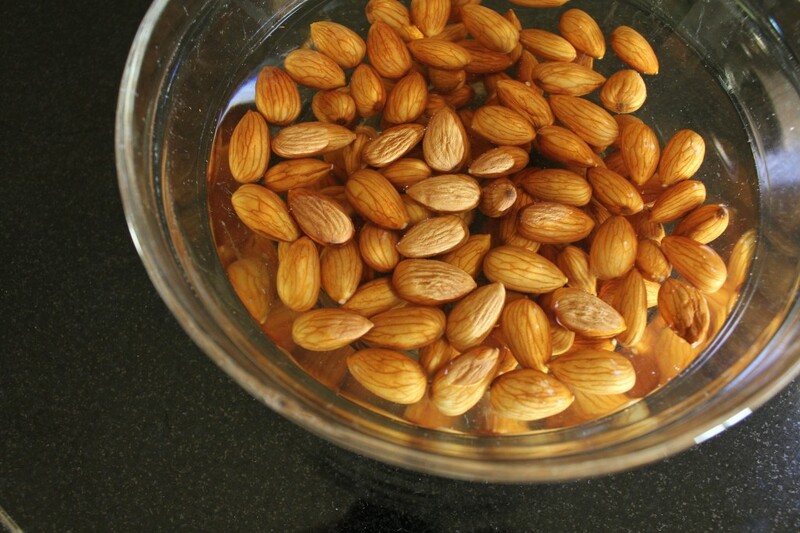 I have also seen recipes which just have you blend the almonds with their soaking water. I wondered if you knew of any nutritional differences between the methods? Thanks so much! And I really look forward to getting your blog –so interesting and helpful! Thanks for your great website it is so helpful. I tried the almond milk with almonds that I had soaked overnight. Then slipped off the skins and blended. Is this OK to do or have I lost a lot of nutrients by doing this? Hooray! 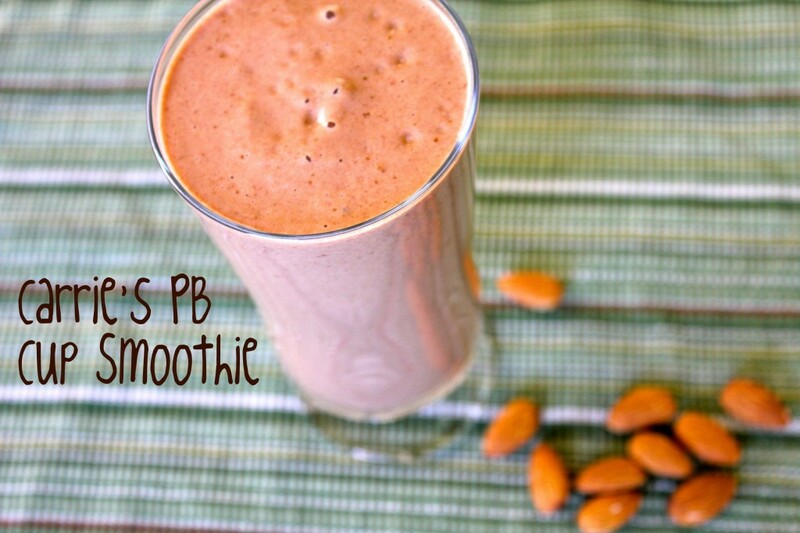 You make your own nut milks too! I’m currently drinking sunflower seed walnut (raw) in my coffee!